MALAGA WATER HEATER GAS ELECTRIC MK5 GE 5E. The Malaga MK5 is a high capacity storage water heater that heats water with an efficient gas burner, and the GE has the additional benefit of a 750-Watt mains electric immersion element. 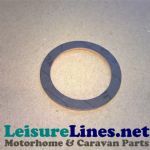 It can provide a quick and efficient hot water supply for touring caravans, motorhomes boats, horseboxes and specialist vehicles. Its compact dimensions make it most suited to panel van conversions, where its short inward length from sidewall flue ensures it fits most planned cupboard and seatbox sizes. The Malaga water heater is designed with many benefits. Larger 13.5 litre capacity for longer availability of hot water. (Cascade 9 lt., Jolly 10 lt., and Truma 10 lt.) Efficient gas burner - for faster warm up. 750Watt element use it on its own or combined with gas operation for an even faster warm-up. 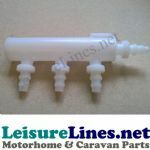 ( operates independently of the gas functions so does not need to be connected until you are ready to use mains hook up later in conversion) Small flue terminal enables a neat installation. Room sealed combustion ensures safe operation. Easy to fit and service, all connections and circuit board are on the rear of the unit. All gas functions and 12volt electronic ignition is controlled by remote wall switch. New microprocessor electronic control, which has zero power consumption when idle, turns on the heater at the flick of a switch and supervises burner operation. Resettable high temperature thermal cut out, to ensure safety, just press a button to reset. Wall switch matches the CBE modular plates range of electrical switches. 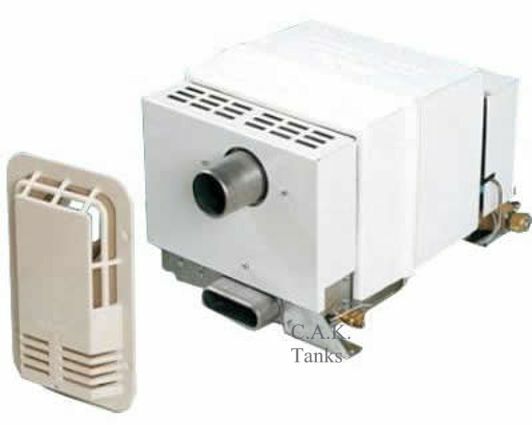 The heater will operate with microswitched and pressurised water systems. Direct replacement of Carver Cascade with use of adaptor plate, see related items tab.